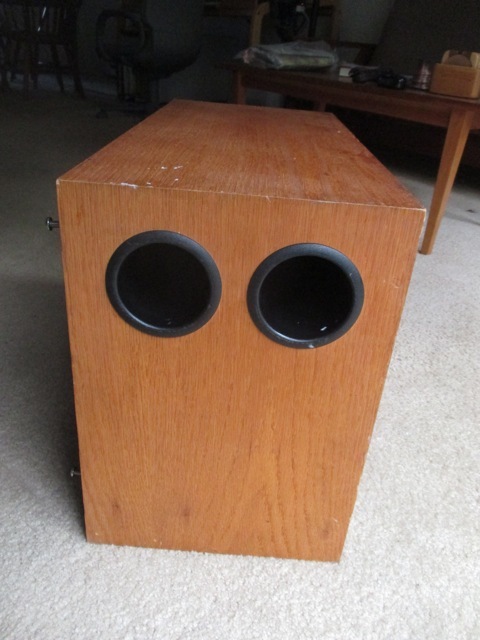 I bought a used kg sw subwoofer on ebay and was already aware it was missing the feet. The mounting holes are unthreaded and slightly over 3/8" diameter. The mounting surface is 3/4" thick. The mounting feet must snap in, I'm guessing. Anyone know where I can get OEM feet? Ideally, I'd like to place it horizontal but I'm guessing the feet were removable for flexible positioning. If I can't get feet, should I plug the holes? Suggestions on what to use? Anyone know where I can get a manual? I can offer no help, but glad to see you finally got the sub you have been looking for. Good luck with it and let us know your thoughts after playing with it. Air leaks will degrade performance, be sure the cabinet is sealed is my best advice. If you can't find any factory feet just install new ones, any hardware store should carry rubber feet if not Parts Express has many to choose from. Thanks for the kind words. I plan to report on it once it's up and running. And, I know where to get spare parts if I need 'em ;-) . Jason-I couldn't get the back of the subwoofer off after removing the screws, to inspect the seal/insides- it must be glued on as well. The terminal cup has a thin rubber gasket. I wiggled out one of the woofer ports to discover the glue which held it in had dried, which is why I suspect the back is glue sealed as well. Any suggestions on how to remove the back would be appreciated. Just make sure the old holes for the feet don't leak air. Put some wood puddy or a glued doll into the old hole. Then you can put new feet where the old ons were. Jason is right, prevent leaks! My basement stereo system is a sub/sat combination. The satellites are Bose 161's and with their "twiddler" 2" drivers, have absolutely NO low end. I laughed the first time I powered them up! Not being too fussy about my basement system, I hastily searched craigslist and found a Sony 12" powered subwoofer for $75. Bonus that it was less than a mile from my house! While I'm not too crazy about how ported bass sounds, it did the job. But what annoyed me is the fact that it drew current even in Standby mode. I don't care that it was rated Energy Star compliant; it was wasted electricity. But as far as I knew, no one made a passive subwoofer. The other problem with the Sony is that when radio personalities would speak and pronounce "bilabial" consonants such as "b" or "p", the subwoofer would add an unnatural "pop" to the sound that I couldn't get rid of regardless of the level or crossover settings. 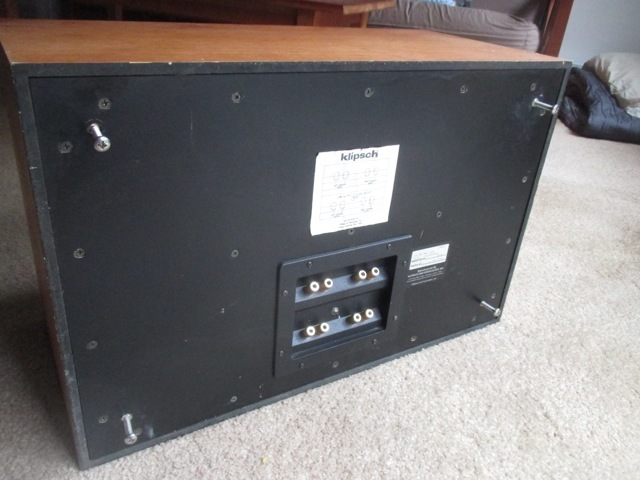 So when I discovered Klipsch made a passive subwoofer, I was all over it! Bonus was that the speaker outputs are high pass filtered. It took me about 8 months of craigslist and eBay searching but I scored one last week. The cabinet was in fair shape and may be a fun restoration project in the winter but for the basement, it's fine. In fact, I'd refinish it now but one of the bass ports won't come out and I want to remove it to sand the veneer. However the basement has a concrete floor and the subwoofer didn't come with feet. Moisture from the concrete would eventually ruin the veneer so I had to cobble something together. 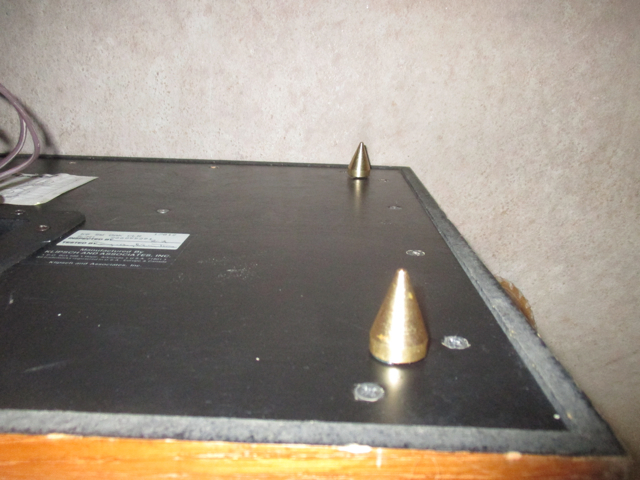 The subwoofer has unthreaded holes where mounting feet would presumably fit. 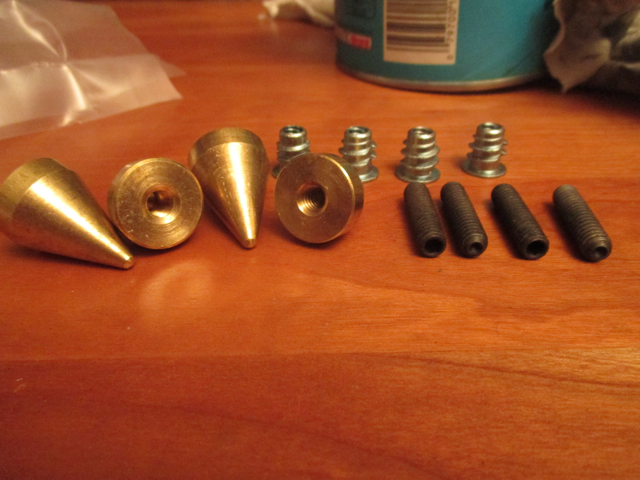 I took some measurements and bought some brass, threaded wood inserts that pretty much screwed right in. My mistake was applying Loctite 242 to the 1/4-20 screws. 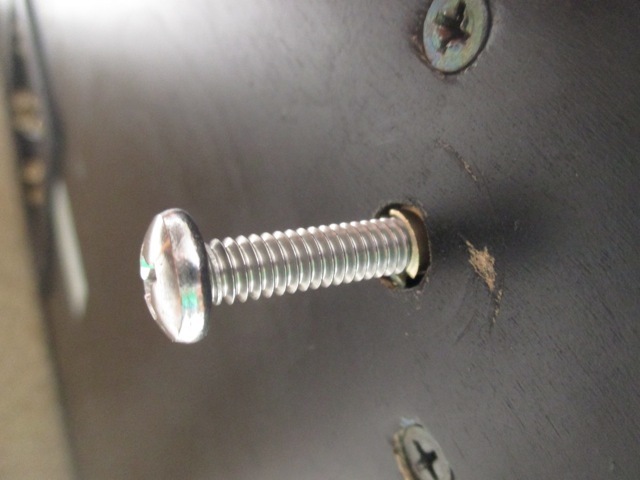 They set up so hard when I turned the screw, the insert would back out. So I separated the parts and reinstalled the inserts with some wood putty. The screws needed some length so the banana plugs wouldn't hit the floor. I wired it up today and put 'er to the test using my Boston Acoustics Rally Bass Collection CDs. With the ports about 2" from the wall and the efficiency switch set to the lower 91dB output vs. 94dB, the bass was overpowering, even when I turned my tone control to minimum (-5). So I turned the subwoofer around to face into the room and the sound smoothed out, but still dominated the Bose twinkies. Clearly the sub and sat aren't matched for efficiency. I set the bass control to -2, which made the best match. Now the pops are gone and I've still got the bass I want. Yeah; I could see where the powered sub had the advantage in adjusting level and crossover but I'm pretty happy. Update. I e-mailed Klipsch asking if they had any kg sw subwoofer feet. They were great and actually replied. I was told they no longer stock the feet, but recommended I check out Meniscus Audio. Their Extra Points feet look way better than my 1/4-20 screws and the large base on the cone means they'll have the support and will less likely bend. I'll post if I buy a set. Interesting note: Why is it we're on the Klipsch forum but the auto spelling checker highlights "Klipsch" as an unrecognized word?! The spell checker is on your device (PC, phone, tablet, etc) and not the klipsch website. I received my Meniscus Audio Extra Points feet in the mail this week. 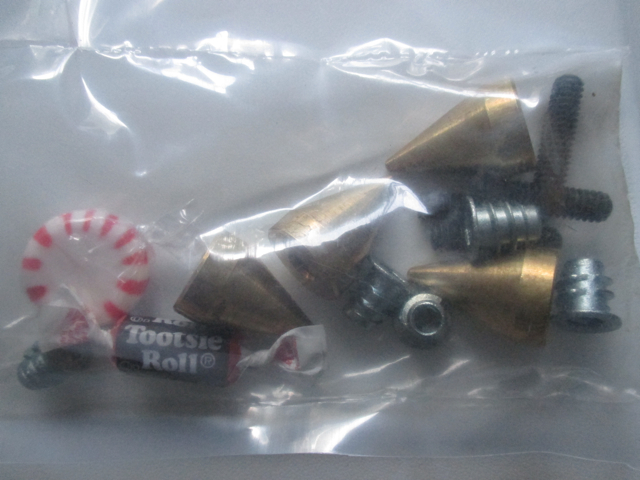 They came packed with a little treat inside! 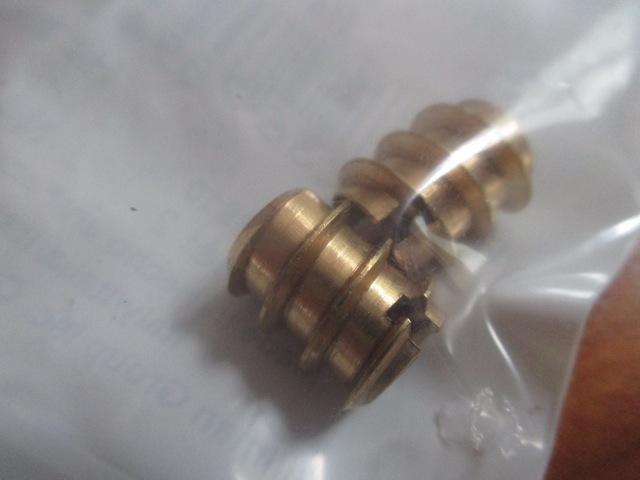 The threaded inserts are flanged so they won't thread completely into the cabinet and get lost, a much better design than the threaded inserts I picked up from the big box hardware store. The threaded steel shaft has an allen key insert at one end for easy adjustment. Needless to say, installation was a cinch and they look better and are much sturdier than my home brew solution above.